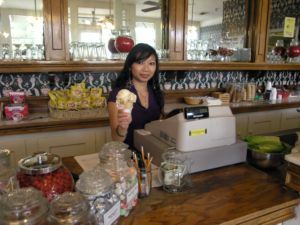 Located in the Pacific Hotel at History Park, O’Brien’s Ice Cream Parlor and Candy Shop features local Treat Ice Cream, retro candy and refreshments. The Candy Store & Ice Cream Parlor is a recreation of a San Jose icon. Acclaimed as “the prettiest and most attractive candy store on the Pacific Coast,” O’Brien’s Candy Store was more than a business to San Joseans, it was an institution — the natural spot to stroll to after a show or the ideal place to meet a friend on a lazy afternoon. O’Brien’s was the first place to serve ice cream and sodas west of Detroit in 1878. It was founded in 1868 by Maurice O’Brien, an Irish immigrant. With $500 in his pocket, he began his San Jose candy business by selling baskets of candy in the doorway of the Pacific Hotel. Soon outgrowing his doorway location as his business rapidly prospered, O’Brien moved to a corner stand at First and San Fernando Street, and in 1874, to 30 South First Street, the home of O’Brien’s Candy Store for the next fifty-three years. O’Brien’s confectionery and restaurant twas operated until January 1956, at which time the business closed. On March 19, 1956, all furnishings and equipment were sold at auction on the premises. Another family institution in the San Jose area is the Treat Ice Cream Company. Locavores will savor the ice cream flavors that change seasonally, made from natural and fresh ingredients. The re-creation of O’Brien’s Candy Store was sponsored by The Rotary Club of San José. Search History San José’s Online Catalog for historic images of O’Brien’s Candy Store from the History San José Collection.